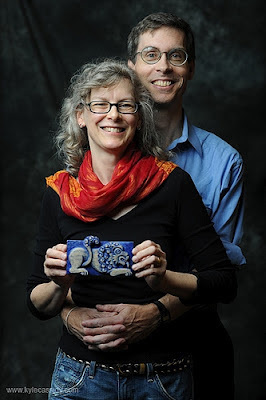 With the upcoming release on 9th October by ChiZine Publications of "The Indigo Pheasant", the second volume in "Longing for Yount" series, I have the pleasure to host Deborah Mills and Daniel Rabuzzi as my guests for a post. I am very fortunate that my wife Deborah Mills is my artistic partner on The Choir Boats (ChiZine Publications/CZP, 2009) and The Indigo Pheasant (CZP, 2012). 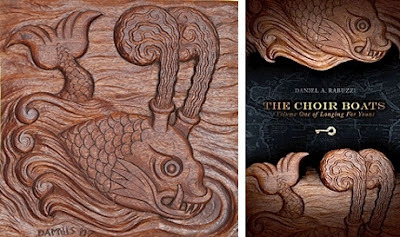 Deborah's carvings of sea monsters form the basis of the beautiful covers that CZP's Erik Mohr designed. Here we see photos of Deborah's originals set next to the covers of the novels. CZP granted me great artistic control, for which I am grateful. And with Erik Mohr on both books, and Danny Evarts providing great design on the interior of the second novel, CZP paid very fine attention to the visualization of my story. This matters: the books are physically handsome, a quality that enhances the reading experience. My text flows from images and images in turn tip out of the text as read by visual artists such as Deborah, Erik and Danny (You can read more about this at The Fantasy Book Critic and at That Artsy Reader Girl). But let Deborah speak for herself: "The first step for me is always looking at the artwork and decorative elements of the time I want to refer to, then coming up with my own 'versions' of the ornamentation that grabs me. Looking, for me, means doodling, just trying out ideas in sketches. Since Daniel's novels take place primarily in London during the second decade of the 1800s, I went hunting for period-appropriate imagery, to create an authentic 'look and feel' for his story. 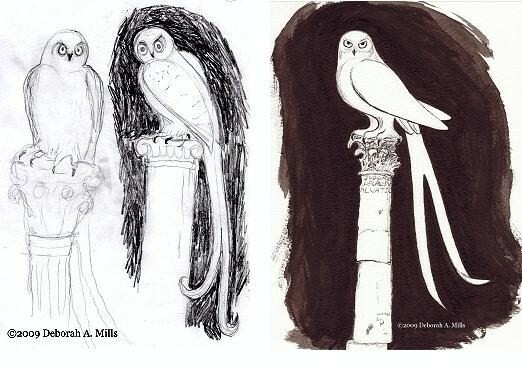 I re-visited sketches I had made at the Victoria & Albert Museum on several visits, and likewise images I had drawn over countless hours spent at The Metropolitan Museum, and at the Winter Antiques Fair held at The Armory on Park Avenue in Manhattan. I searched through old Sotheby catalogs I found at The Strand Bookstore in New York City, and so on." Deborah sketched many teapots, plates and tea bowls, and, of course, made a special study of the pheasants ornamenting the porcelain. Deborah also spent hours working on Charicules, the saulary who enters the story in the second novel. 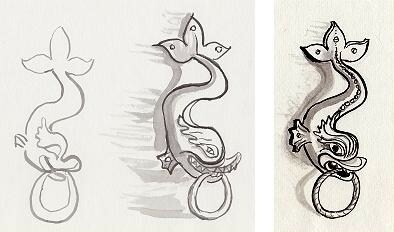 Some illustrations, especially from The Choir Boats, Deborah created through trial-and-error without pencil sketches; she just kept doing loose ink and brush drawings over and over until one felt "right." Ah, and then came Deborah's many attempts to capture Strix Tender Wurm. As she says: "I drew so many owls trying for represent Daniel's extremely scary villain! I kept coming back to one of my earliest doodles - it had a threatening feel to it that I was after. 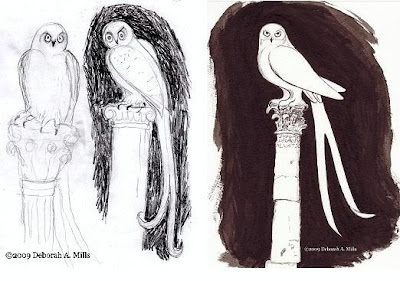 For the ink drawing, I sketched in pencil, then ink, and very carefully painted in the dark background." Deborah also had to decide between versions. In her words: "The right swan had a lighter spirit, but I darkened the piebald splotches to foreshadow bloody events to come; iron shackles and chains refer to slavery; I wanted the atypical scrolls of the iron bar supporting the sign to hint at the foreign-ness of the purveyors of the Piebald Swan coffeehouse. I deviated from the text here since the coffee house would have been wooden, not stone." As the author, let me close by saying again how lucky I am to work with an artist as deeply engaged with my text as Deborah is. Her illustrations on both books helped inspire me as I wrote. Daniel A. Rabuzzi studied folklore and mythology in college and graduate school, and keeps one foot firmly in the Other Realm. 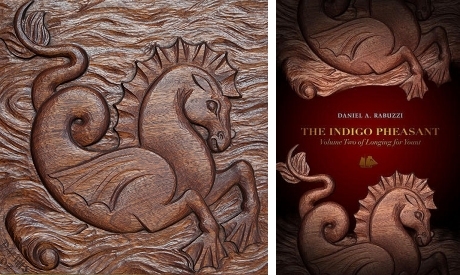 ChiZine Publications published his first novel, The Choir Boats: Volume One of Longing for Yount, in 2009, and in 2012 brought out the sequel and series conclusion, The Indigo Pheasant: Volume Two of Longing for Yount. Daniel's short fiction and poetry have appeared in Sybil's Garage, Shimmer, ChiZine, Lady Churchill's Rosebud Wristlet, Abyss & Apex, Goblin Fruit, Mannequin Envy, Bull Spec, Kaleidotrope, and Scheherezade's Bequest. He has presented at Arisia, Readercon, Lunacon, and the Toronto Speculative Fiction Colloquium. He has also had twenty scholarly and professional articles published on subjects ranging from fairy tale to finance. A former banker, Daniel earned his doctorate in 18th-century history, with a focus on family, gender and commerce in northern Europe. He is now an executive at a national workforce development organization in New York City, where he lives with his wife and soulmate, the artist Deborah A. Mills (who illustrated and provided cover art for both Daniel's novels), along with the requisite two cats.